I have written about the household fridge previously. The cause this time is not because it has again gone feral. Infact quite the opposite, the fridge is getting frequently cleaned, namely because we’re on our third for the past two weeks. The current fridge simply disobeys the thermostat. 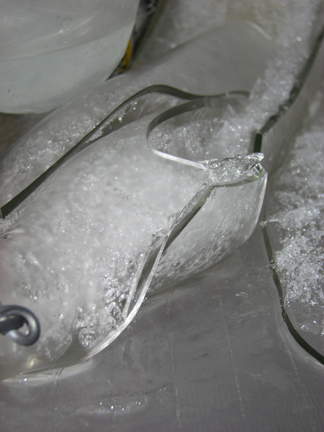 The photo is of what happened to glass water bottle. The frozen explosive arrangement was pretty spectacular! Next Post Buy Something Day! Perhaps you just have unrealistic expectations of how a fridge should behave? Maybe you and your fridge should sit down and have a round table family discussion about the fridges role in the family, and what kind of behaviour you expect from it. While entertaining, questions like “what would the fridge look like after someone through it at a koala… preferably a distant koala on a high branch”, such questions are likely to cause the fridge to question whether it is really loved and valued in your house. Scary questions like that have caused lesser fridges to commit fridgicide.